Citation Information: JCI Insight. 2019;4(7):e126471. https://doi.org/10.1172/jci.insight.126471. The autoantigen-specific Tregs from pluripotent stem cells (PSCs), i.e., PSC-Tregs, have the ability to suppress autoimmunity. PSC-Tregs can be programmed to be tissue associated and to infiltrate into local inflamed tissues to suppress autoimmune responses after adoptive transfer. Nevertheless, the mechanisms by which the autoantigen-specific PSC-Tregs suppress the autoimmune response remain to be fully elucidated. In this study, we generated functional autoantigen-specific Tregs from the induced PSC (iPSCs), i.e., iPSC-Tregs, and investigated the underlying mechanisms of autoimmunity suppression by these Tregs in a type 1 diabetes (T1D) murine model. A double-Tg mouse model of T1D was established in F1 mice, in which the first generation of RIP-mOVA Tg mice that were crossed with OT-I T cell receptor (TCR) Tg mice was challenged with vaccinia viruses expressing OVA (VACV-OVA). We show that adoptive transfer of OVA-specific iPSC-Tregs greatly suppressed autoimmunity in the animal model and prevented the insulin-secreting pancreatic β cells from destruction. Further, we demonstrate that the adoptive transfer significantly reduced the expression of ICAM-1 in the diabetic pancreas and inhibited the migration of pathogenic CD8+ T cells and the production of the proinflammatory IFN-γ in the pancreas. These results indicate that the stem cell–derived tissue-associated Tregs can robustly accumulate in the diabetic pancreas, and, through downregulating the expression of ICAM-1 in the local inflamed tissues and inhibiting the production of proinflammatory cytokine IFN-γ, suppress the migration and activity of the pathogenic immune cells that cause T1D. 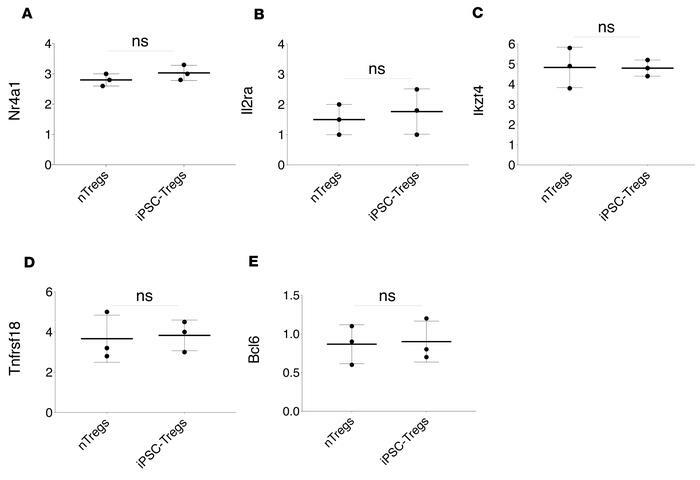 Characterization of autoantigen-specific nTreg-like iPSC-Tregs. PCR analysis was performed by TaqMan real-time PCR. Primers for sequences were used as follows: (A) Nr4a1, forward 5′-TGTGAGGGCTGCAAGGGCTTC-3′, reverse 5′-AAGCGGCAGAACTGGCAGCGG-3′; (B) Il2ra, forward 5′-AACTGCCAGTGCACCAGCAAC-3′, reverse 5′ GAGGTGGCTCCCTGCAGTGAC-3′; (C) Ikzf4, forward 5′-CAATCTGCTTCGCCACATCAAG-3′, reverse 5′-GCCACAGTAGTTGCACTTGTAG-3′; (D) Tbx21, forward 5′-GGAGCCCACTGGATGCGCCAG-3′, reverse 5′ AGGCAGCCTCTGGCTCTCCATC-3′, Tnfrsf18, forward 5′-CCTGCCAACCAGGCCAGAGGG-3′, reverse 5′-GTCCAAAGTCTGCAGTGACCG-3′; and (E) Bcl6, forward 5′-CACACCCGTCCATCATTGAA-3′, reverse 5′-TGTCCTCACGGTGCCTTTTT-3′. Data shown are representative of 3 identical experiments. The values represent mean ± SEM (n = 3). ns, P > 0.05, Student’s 1-tailed t test.